What should you learn about Search.dailysocialbuzz.com? Search.dailysocialbuzz.com is an intrusive browser hijacker that can definitely interfere with your web browsing experience. Search.dailysocialbuzz.com will modify your web browser’s settings. We have to say that all the popular web browsers are compatible Search.dailysocialbuzz.com. Unfortunately, the browser hijacker can infect your Google Chrome, Mozilla Firefox, and Microsoft Internet Explorer. 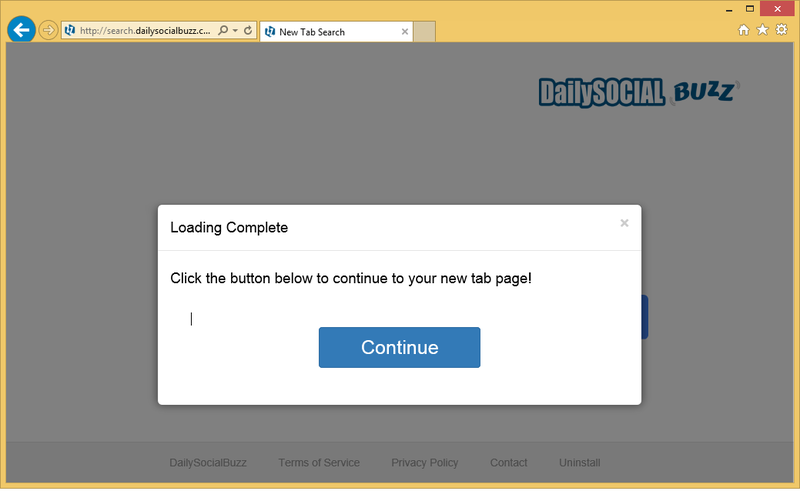 Once the Search.dailysocialbuzz.com hijacker reaches your virtual machine, you will soon find a new tab, search engine and home page. All of them will most probably lead to Search.dailysocialbuzz.com infection. We do not recommend visiting the web site. In addition to that, you should stay away from the Search.dailysocialbuzz.com search engine. The search results are flooded with ads that can lead you to the very dark side of the World Wide Web. How did Search.dailysocialbuzz.com browser hijacker reach the PC? It is probable that Search.dailysocialbuzz.com has found your computer’s system with the help of an infected e-mail. However, there is a much higher chance that Search.dailysocialbuzz.com has infiltrated your PC with software bundles. The majority of browser hijackers find the electronic devices via freeware bundles. In other words, the annoying problems usually travel together with other applications. Nevertheless, there is a way to stop such programs from entering your virtual machine. We have to say that the applications are not able to get to the PC without your consent. You have to agree to the program’s download in the installation wizard. The problems arise when the additional applications’ offers are hidden in the “Advanced” or “Custom” settings. Thus, you should always carefully follow the download process and make sure that the unwanted applications do not find your computer’s system. If the suspicious application has already found a way to alter your PC, you should delete Search.dailysocialbuzz.com immediately. Why do I need to take care of Search.dailysocialbuzz.com removal? If you do not delete Search.dailysocialbuzz.com soon, your computer may be reached by other annoying infections. In other words, having the infections make the PC vulnerable to the other threats. We have to admit that Search.dailysocialbuzz.com removal process can be both: difficult and time consuming. However, that does not mean that you should just let the application stay on the PC. Unless you do not worry to experience and identity theft. Search.dailysocialbuzz.com can leak the information to the suspicious third parties. How to delete Search.dailysocialbuzz.com once and for all? We recommend you to uninstall Search.dailysocialbuzz.com automatically with the help of a reputable malware removal tool. You will only need to implement a reputable security tool that will detect and remove all the threats immediately. More than that, if you keep your antivirus application up to date, you will not have to face similar issues in the future. Just do not forget to perform a full computer scan once in a while.